Most people are familiar with Ginseng (Radix Ginseng) and its fabled elixir-like reputation. This simple, knotted, beige root is steeped in elaborate folklore, mythology and legend. More recently it has been the subject of intensive investigation and clinical trials. Ginseng, Ren Shen in Chinese, was historically viewed as a source of vitality, longevity and even an aphrodisiac - In recent decades and after extensive research we now associate Ginseng with the following benefits: Support for athletes under stress - increase in energy levels prior to and after workouts, immunity support. It is classified as an anti-viral, aids recovery from illness, hepato protective (liver protecting) enabling the liver to detoxify after toxic exposures from pesticides, herbicides and pollution. It can normalize blood sugar and cortisol levels, offering support for insulin resistance (IR) and Cushing’s and is used extensively in anti-aging therapies. Here in the west we usually associate Ginseng with the exotic East - a precious root from behind the bamboo curtain, and while numerous types of Ginseng originate in Asia many varieties are native to the Americas. Indigenous peoples from Maine to Minnesota and as far south as the Georgia coast, utilized preparations of native of Ginseng. The Algonquin, Ojibwa, Cherokee, Oneida and Creek made extensive use of Ginseng. It was called Little Man Root due to its human-like shape. Even Daniel Boone, the famous frontiersman, fur trapper, and explorer was trading Ginseng with settlers along the Ohio River in the late eighteenth century. Regardless of the continent of origination Ginseng is a member of an elite herbal classification known as Adaptogens. Adaptogens are a truly remarkable and talented group. They help the body to maintain optimal homeostasis while adapting to external pressures and stressors both mental and physical. Adaptogenic herbs are unique from other substances in their ability to balance endocrine system, hormones and strengthen the immune system. To be considered a true Adaptogen an herb must be safe with no known side effects. Research on Adaptogens includes more than 5,000 clinical studies, spanning over four decades and involving over a half-million people. They have been used by and benefited Russian Olympic athletes, cosmonauts, the military, and now horses. How to use Ginseng? 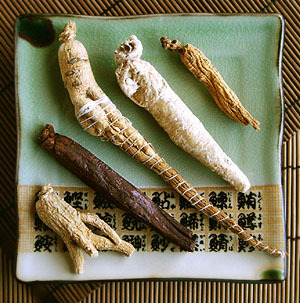 Ginseng comes in many verities, shapes and sizes. While each has a different character and function they share many of the same basic properties. For example Korean Ginseng is considered hotter and more energizing in nature while American Ginseng (Panax quinquefolium) is classified as cooler. A hot, nervous, thoroughbred performance horse with a heavy competition schedule would benefit from the gentler, cooling effects of American Ginseng while a geriatric horse lacking vitality and energy would be a better candidate for a warmer, more stimulating Korean type. Paring the right Ginseng is key to success with your particular horse’s personality and constitutional type. Who can use Ginseng? Adaptogenic herbs like Ginseng are generally considered safe for most humans and horses. Ginseng should be use with caution or avoided in persons with high blood pressure, taking antidepressants or diabetic medication.